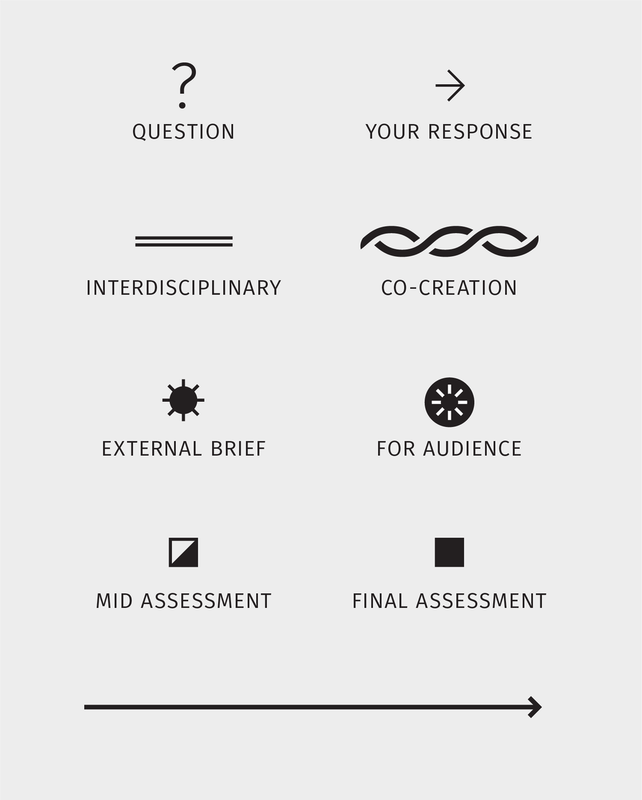 Can an informative course diagram also help students plan and reflect on their design practice? A London university design course offers a strategically evolved experience that teaches students not simply to design nice things, but to question, research, and innovate. But none of this came through in the course diagrams that show the breakdown of the BA and MA courses. By looking at it from a student’s perspective, the diagrams were brought to life and integrated into the student experience. Each University of the Arts London course has a one-page diagram to show what it’s made up of. This A4 diagram is designed for the student handbook. It’s used to help show potential students what to expect if they were enrolled and it’s also used to show current students what’s ahead for their studies. At Central Saint Martins, the Graphic Communication Design’s BA and MA courses are each made of Units, which are similar to classes, but much less structured and always focused on a certain area of development rather than subject matter. For instance, the BA Unit 6 challenges students to explore concepts much bigger than design and communication to see where their expertise can bring influence. The MA Unit 1 facilitates students in reflecting on their past work to synthesize it into focus. But current students only look at the diagram a few times a year and potential students see a rather dull expression of a uniquely captivating course. The diagrams were simply checking a box and weren’t communicating the innovative education the course leaders had crafted. 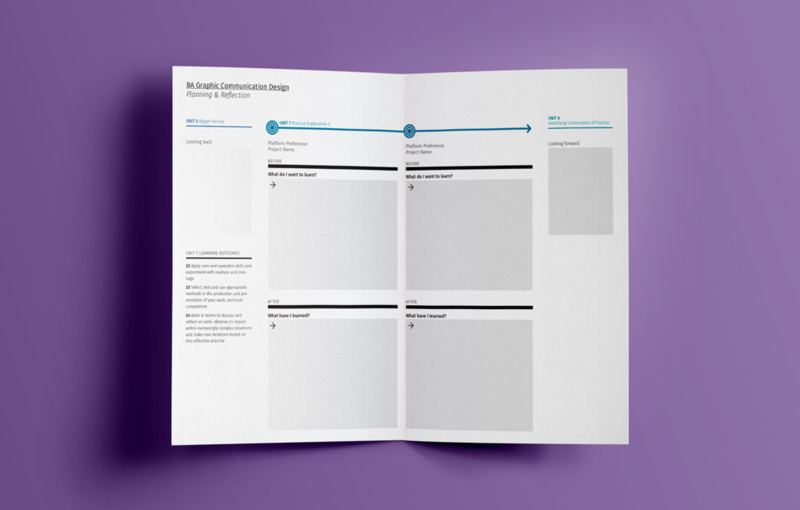 The staff had written the design education experience to be centered around co-creation, which allows the students to craft their own paths of development throughout the course. This powerful and empowering approach should come across in the mandatory diagrams. Instead of simply showing the different Units that make up the course, this diagram shows the evolution of the student’s experience. Each unit consists of open-ended briefs created by or with the tutors. They are simply starting points—the direction a project goes is up to the student. This was a key insight that led to throwing out the boxes in favor of a boundless visual representation of the Units. Each brief is a launchpad for a student to define an area to explore and question. Their answer to a brief is really a response to a question. The emphasis of questions within the course shows the value of critical thinking and defines the personal contribution to the design industry. The course aims to expand the boundaries of graphic communication. In the BA course, students learn how to think critically and take ownership of their own practice and education. The course starts out heavily defined by the staff and tutors. But over time, students begin to take responsibility for their briefs and decide what they want to explore. The diagram shows the expansion of a student’s development through fluid Units of study over three years. It communicates the freedom the course offers while posing big questions that prove the rigor of academia. The MA course challenges students to explore and define their practice within a wider context. 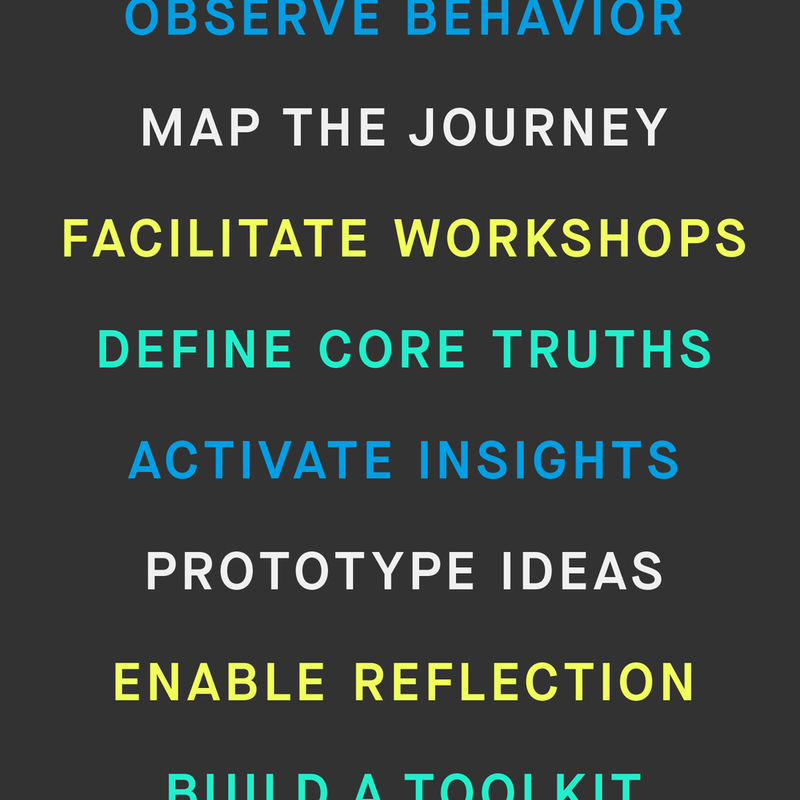 The beginning of the course is made up of a set of integrated briefs that kickstart exploration and questioning. The students then spend time reflecting on the context and meaning of their work to define what they contribute to the industry. The diagram shows the amount of self-direction as the course progresses, highlighting the exciting self-discovery. 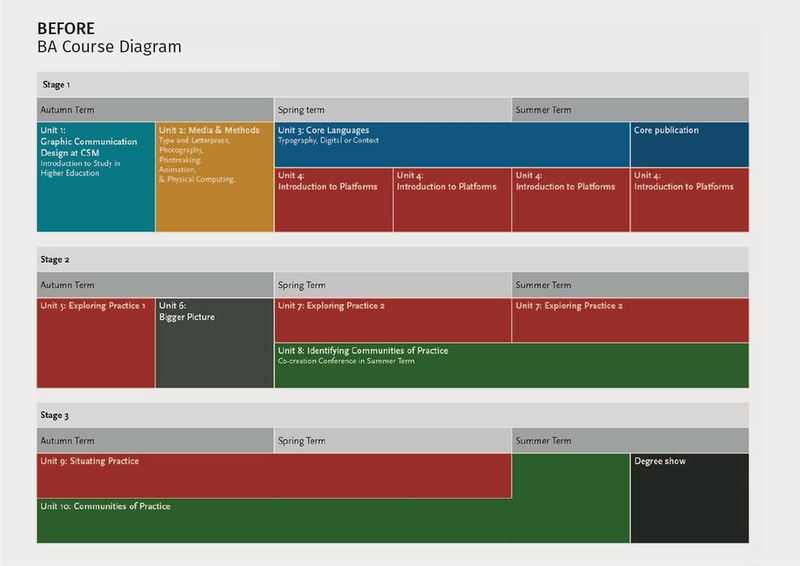 Color and shapes change throughout the timeline to emphasize the development in the student experience, which isn't inherently clear in the titles of the Units. Shapes are a universal language. Each course at CSM is made up of a global mix of students. Shapes begin to eliminate the barrier of language and terminology that can be confusing to a foreign student. What is important to staff and what is important to students aren’t always the same thing. Looking at it from the point of view of a student, there were changes to the diagram hierarchy. 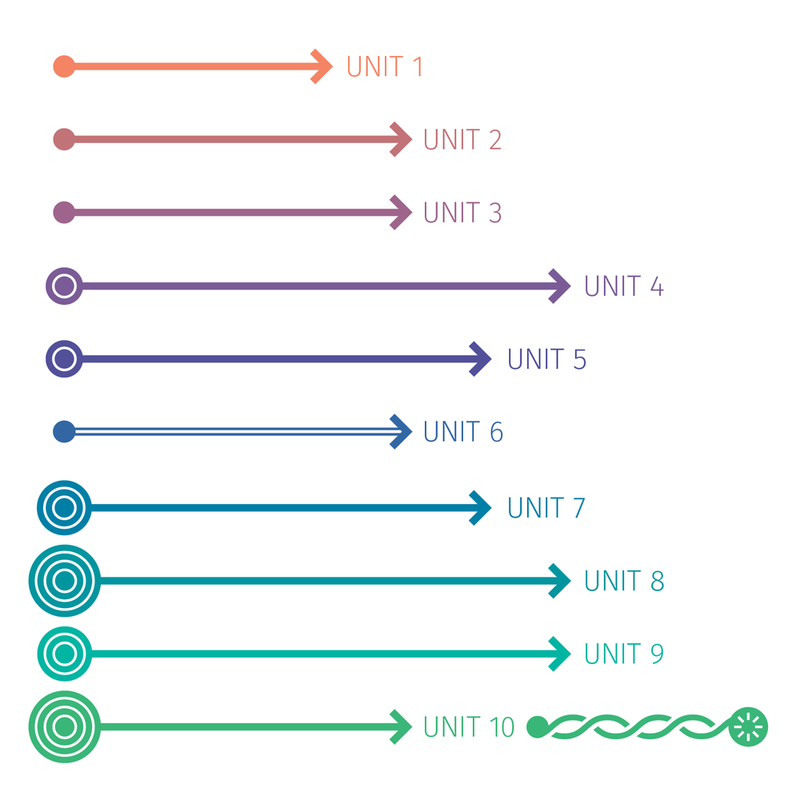 For instance, the Unit numbers were pushed to the background so the questions that drove each Unit were emphasized. The diagram comes to life when it expands to help students both plan for the future and reflect on the past. It became clear that towards the end of the last year of a degree, students begin to panic about what their work is all about. In the face of graduating, they have to look back and make sense of their accumulated work and learning. Although there are practices in place to guide the students, the course diagram was an untapped resource. They were transformed into tools to help students reflect throughout their entire time at university, not just at the end. Also, equipped with a clear map of the entire course, students can use the diagram to plan and map out their choice of briefs and focus throughout their education. The diagram helps to think ahead. The diagram transforms into a Unit-specific worksheet that prompts students to first consider what they want to explore in this Unit’s brief. At hand-in, they will revisit their sheets to reflect on what they learned and how they developed. At the end of each year, BA students will document and summarize the work they’ve done. Succinctly articulating the questions they explored and their responses to them help students see patterns in their work that can help guide them through the next year. This is a useful tool to help students make links between a vast array of exploratory work and to better understand themselves as designers. It’s a supplement to the course that is driven by independent thinking and communities of practice. Thank you to Rebecca Wright, Rebecca Ross and Peter Hall for contributing to the development of this project. If you want to know more about this project, email me. Graduating students show off their unlimited creativity. A royal leather goods store rethinks personalization. A brand strategy process goes through design R&D. 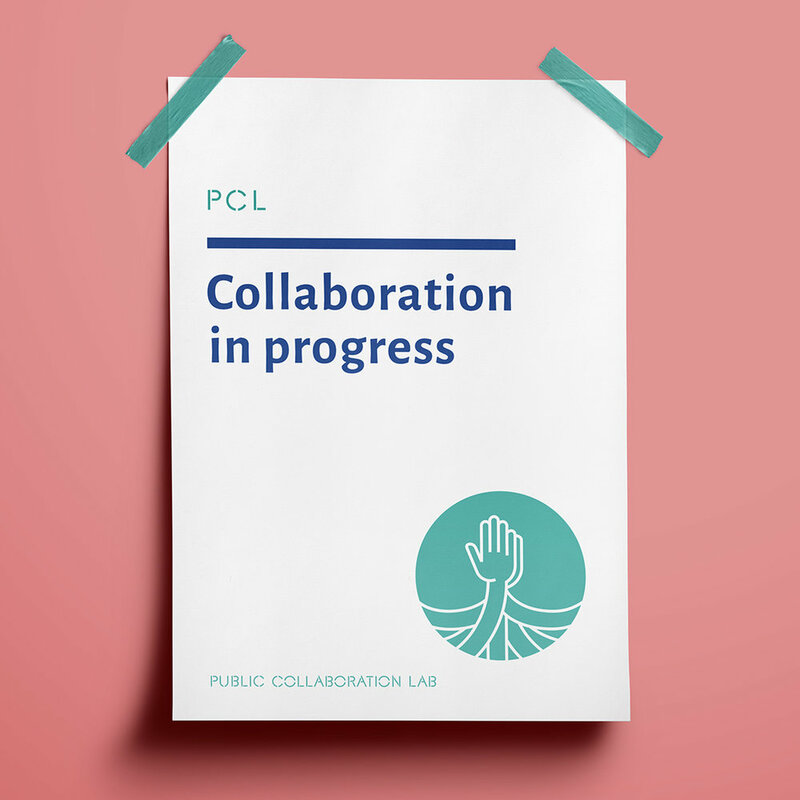 Government and design education collaborate to solve problems.